S Factor Smoothing Lusterizer - I don't typically like products in my hair, especially since mine is so heavy. But this is one that is loved by my hairdresser and myself. It smells of strawberries and cream, lasts forever and only takes a dab. Vitamin Water ZERO - Lemonade - I am constantly looking for a new beverage of choice, though Aloe Gloe and Coconut Water are must haves, every once and a while I like a bit of flavor, and to top it off, it's zero calories, HI, I NEED YOU EVERYDAY. Not really, I don't want to burn out on it. EOS Hand Lotion - My hands are perpetually dry, so I jump at every opportunity to try a new lotion, this has an everlasting smell, beautiful packaging, perfect travel size and does not leave your skin feeling greasy. It has made a big difference in the appearance of my skin over the past few days. Peonies - I love when peonies are plentiful and I look forward to the Spring when they are bountiful and affordable, this being said... you would be crazy not to get them while you can. 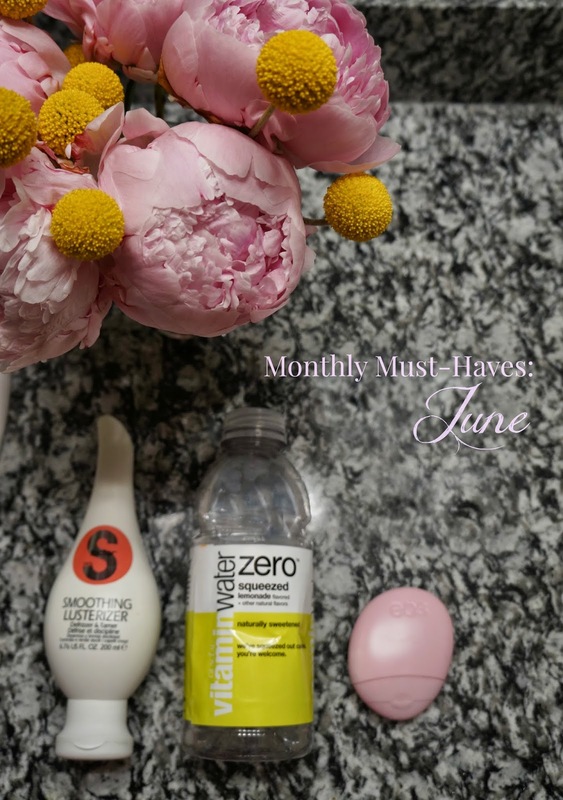 Any must-haves that you have monthly? Fill me in below!